How to add content from Pinterest to my social wall? To add a Pinterest profile, keyword or playlist as a source to your social wall, you first need to connect your Pinterest account to Walls.io. To do that just go to Settings > Sources in your Walls.io dashboard, select Pinterest and click connect. 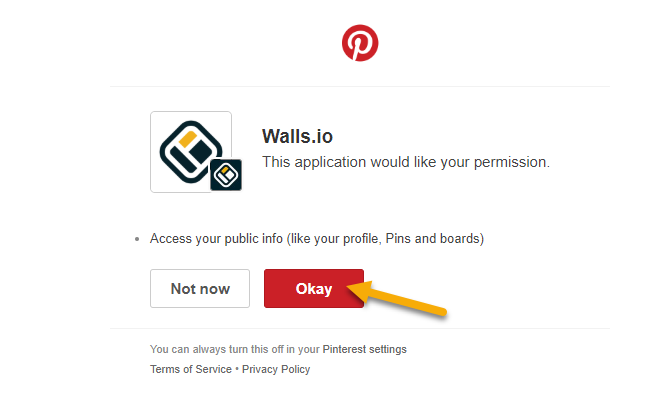 Then give Walls.io the necessary permissions to connect to your Pinterest account by clicking Okay in the confirmation dialogue. To add a Pinterest board as a source to your social wall go to Settings > Sources in your Walls.io dashboard and select Pinterest > Board. 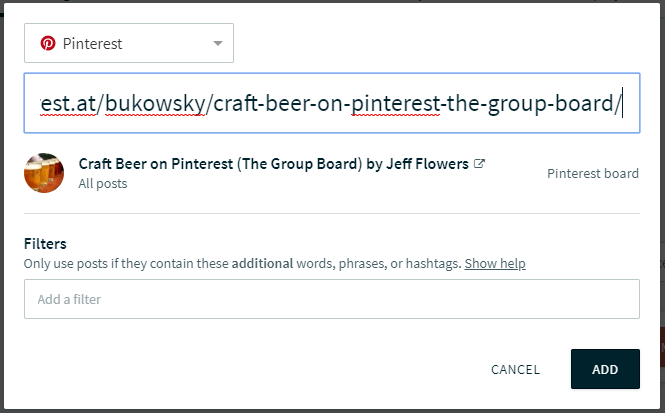 Then simply add the URL of the board whose content you would like to display and click "ADD".